When magician extraordinaire Justin visits Sesame Street to put on a magic show for the whole neighborhood, Elmo wants to be a part of the big event. But there’s one problem…Elmo can’t do magic! That’s when Elmo teams up with Abby and Justin, embarking on an amazing journey where Elmo will discover the “power of yet” —the lesson that with perseverance and practice, nothing can stand between you and your dream. Along the way, Elmo and Abby, joined by their friends Cookie Monster, Big Bird, Grover, Rosita and Count von Count, discover the many magical moments in everyday life. In the end, Elmo learns that you can do anything you set your mind to if you just keep trying! 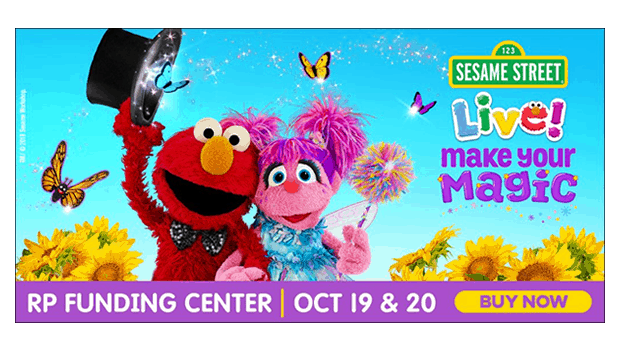 Join your favorite Sesame Street friends on this magical adventure when Sesame Street Live! Make Your Magic comes to your neighborhood.